One of the most famous buildings on earth, Gaudí’s basilica is an evolving wonder that draws visitors from far and wide. The most iconic feature on the cityscape of Barcelona, the Sagrada Familia is a towering basilica and the magnum opus of architect Antoni Gaudí. With its eight dramatic spires rising high above the streets below, it can be seen from across the city. It attracts thousands of visitors every day who come to admire the intricate façade and take the lift to the top of the towers to look out across the vista. Work on the project began back in 1882 before Gaudí took it on a year later. He worked on it until the end of his life, but left it unfinished – the basilica is still under construction to this day and is only expected to be completed in the late 2020s, such is its ambitious scope. Today the basilica is listed as a UNESCO World Heritage Site. Bringing together art nouveau and gothic architectural styles, Gaudí built an extravagant façade with striking towers and spires that give it the appearance of an intricately-designed sandcastle. When you step inside, you’ll see its marvellous tree-like columns, the elaborate detail on the ceiling and the natural light flooding in from outside. Take the lift to the top of the towers and you’ll be rewarded with magnificent views across the city. Bear in mind however that children under six years of age, expectant mothers, and anyone with reduced mobility are not permitted to go up, and that you’ll have to take a steep and winding staircase to come back down. Audio guides are available to accompany you on a tour that lasts around an hour and 45 minutes around the building, giving detailed information. There’s also a guide specially created for children that lasts about 40 minutes. Head to the audio-visual room to see a 20-minute film exploring the church’s history, or check out the basement’s museum to learn more. There’s a gift shop on site if you want to pick up a few souvenirs of your visit. You can also come to observe daily masses held here in both Catalan and Spanish. The church is easy to reach by bus or metro and is open daily. Tickets can be bought in advance if you want to avoid the queues and children under the age of 10 get free admission. 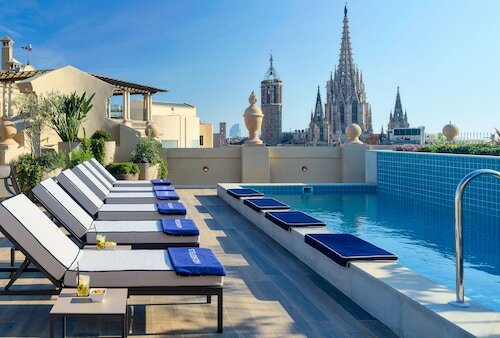 Examine our Barcelona things to do page to discover more activities while you're in the area. Learn about the life of the great Catalan architect Gaudí at the signature house he built specially for an aristocratic family. Another modernist Gaudí masterpiece, this is a surreal house with unique sculptures and colours. 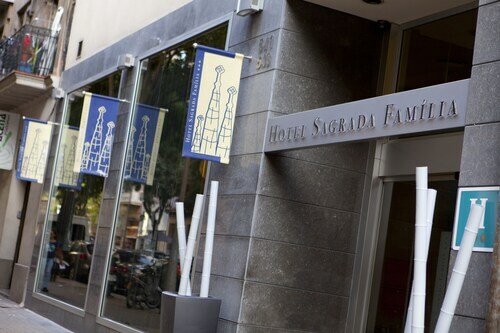 Located in Eixample, this hotel is within a 15-minute walk of Sagrada Familia and Hospital de Sant Pau. Casa Mila and Passeig de Gracia are also within 1 mi (2 km). Sagrada Familia Station is 5 minutes by foot and Sant Pau Dos de Maig is 9 minutes. 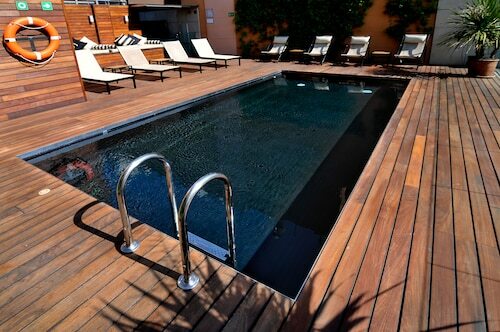 Located in Eixample, this hotel is within a 15-minute walk of Sagrada Familia and Hospital de Sant Pau. Casa Mila and Passeig de Gracia are also within 1 mi (2 km). Sagrada Familia Station is only a 4-minute walk and Verdaguer Station is 10 minutes. 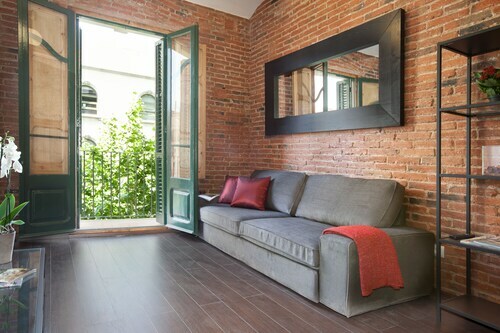 Located in Eixample, this apartment building is within a 15-minute walk of Sagrada Familia and Hospital de Sant Pau. Casa Mila and Passeig de Gracia are also within 1 mi (2 km). Sagrada Familia Station is only a 5-minute walk and Verdaguer Station is 9 minutes. 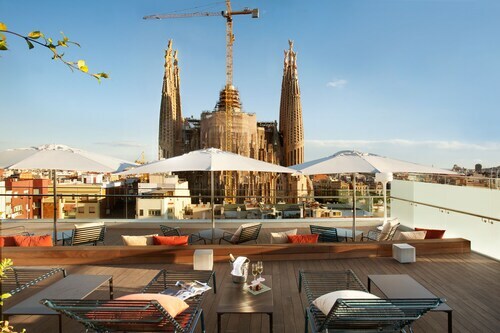 This design hotel, situated in Barcelona’s Sant Martí neighborhood, is next to Torre Agbar, and 5 blocks from Teatre Nacional de Catalunya. Arc de Triomf is 2 km (1 mi.) away. 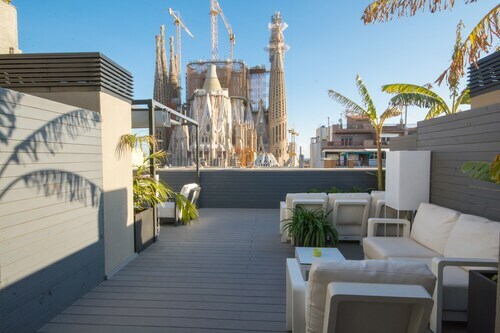 Located in Eixample, this apartment building is within 1 mi (2 km) of L'Auditori, Sagrada Familia, and Casa Mila. Casa Batllo and Hospital de Sant Pau are also within 1 mi (2 km). Sagrada Familia Station is 6 minutes by foot and Verdaguer Station is 6 minutes. 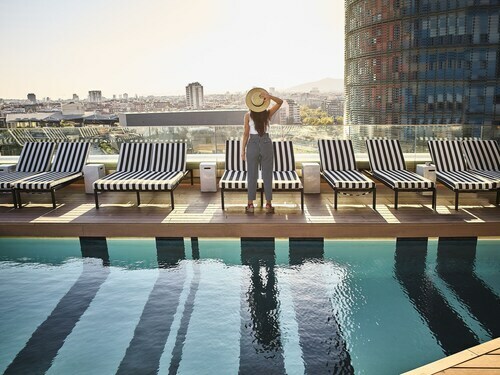 Situated in the L'Eixample District of Barcelona, this hotel is 4 blocks from Casa Batlló and 9 blocks from Sagrada Família. Palau de la Música Catalana is 2 km (half-mile) from the hotel.